The Fed was looking at inflation, the red line, when it should have been looking at the percentage change of (N)GDP, the blue line. NGDP was dropping by percentage in early 2007, actually starting in 2005, while inflation did not drop until nearly 2009. Of course we have to look at sticky wages for the private sector and we see the greatest percentage drop is attributed to the Great Recession, as many well paying jobs were lost in fall of 2008, leading to the greatest percentage of hourly earnings drop in 2009. The "sticky wage" concept is that wages, in normal times, tend to creep up. They may even put businesses into a noncompetitive global position. Business had been offshoring jobs, in the process of hollowing out manufacturing in America, even before the Great Recession. The New York Times showed that in early 2008, prior to the mass layoffs at the end of the year, there were real problems growing in the treatment of workers. According to the Times, productivity grew 60 percent between 1979 and 2007, yet wages stagnated. While I ignore the average wage figures in the article, they could have been higher according to this chart, the productivity clearly has not been rewarded for workers. The Great Recession unstuck sticky wages. Layoffs were massive in late 2008 as companies are not keen to drop wages, as was done to my father in the Great Depression of the last century. His wages were dropped substantially, but workers were still needed in a developing nation, especially in the oil patch. He kept his job. My father knew an oil worker who worked for an oil company called Superior Oil. He was paid in stock rather than in wages, because the company could not pay wages. He saved the stock and became a millionaire after the Great Depression, while still wearing overalls. We saw a combination of furloughs, and layoffs and cuts in wages in the Great Recession. And people feared quitting, putting the classical economists' concept that people would just quit because of lower wages into hibernation! And wages are so sticky they are not going up to reflect productivity gains, after the Great Recession, either. The combination of slowing wage growth and labor participation being low can be attributed to the credit crisis and Fed policy in the aftermath. Wages are quite sticky until growth is hindered for some time. The first chart above shows that GDP was dropping even during the house bubble in 2005. Wage creep could have motivated the Fed to look the other way as warning signs signaled the Great Recession and it could have made the recession much worse. 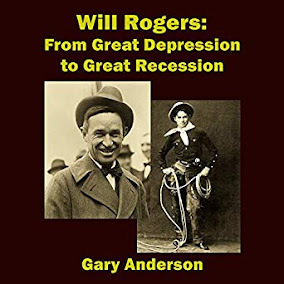 With the Great Recession, the Fed may have tried to make the US more competitive, and yet, because of the damage to the American consumer, the worker, the whole world has slowed down. NGDP targeting, which takes into account what was seen on the first chart above, would simply interfere with plans to deepen recessions going forward, in order to force Americans to accept lower wages still. That is not the reason given by central banks for not applying that targeting. Keep in mind that wages in private manufacturing are where the biggest hit took place. Most public service jobs, though thinned out, kept wages very sticky. Many in the private sector have given up looking for work. Regarding recovery, perhaps the central banks were counting on China to boost or stabilize asset inflation and middle class spending among a large, growing middle class. That could prove to be a damaging central bank miscalculation as China is slowing and its asset purchases have slowed. Americans buy the world's excess goods, until they don't. The Fed believed that the recovery would be faster. Bernanke said there would be bull markets somewhere, growth somewhere. Perhaps sticky low wages kept his visible hand from a successful reflation. This plan to slow the growth of wages, especially in manufacturing, to reduced house prices from bubble territory, to weaken the middle class wealth and worker wages, and cause banks to continually profit from low interest rates "succeeded". But what will be the cost of this decimation of America's working class going forward? 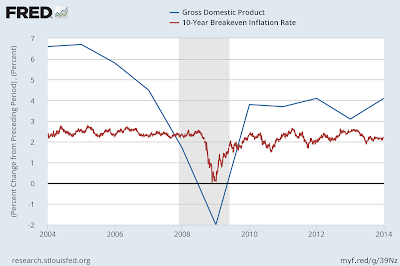 Will recessions deepen going forward because of monetary policy decisions? Perhaps a strong middle class in America is essential to the strength of the world economy. Central banks, with the Fed in the lead, could have tried to preserve many of these well paying jobs by targeting NGDP. They are now being replaced by lower paying jobs. In the Great Recession, the banks got houses back, received guaranteed mortgages if they didn't short sell, and bailout money. 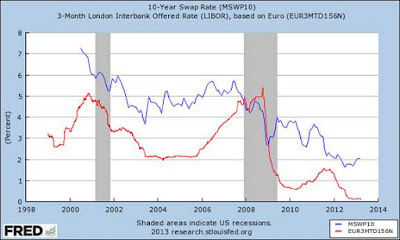 The banks won in major fashion on bets on low interest rates in the swaps markets as rates continued to drop even further. There are new demands for bonds as collateral, that constrain interest rates, even when growth occurs. And, if something doesn't change, in order to establish a successful and healthy reflation, we could be facing cashless societies and negative interest rates. I wrote about those here and here and here.